"black and white and... all over"
H&F Fine Arts announces a group exhibition of Washington, D.C.-based photographers. Taking its name from the old standby about newspapers (“What’s black and white and read all over?”), the show presents a survey of black and white photography from the D.C. metropolitan area. Artists included in the exhibition are Erin Antognoli, James W. Bailey, Danny Conant, Max Cook, Stephen Crowley, Justin Hoffmann, Michael Dax Iacovone, Nick Jbara, Jane Jeffers, J.T. Kirkland, Angela Kleis, Prescott Lassman, Thomas Paradis, Aleksei Pechnikov, Susana Raab, Alexandra Silverthorne, Jim Tetro, Bryan Whitson, and Lloyd Wolf. "Sometimes I wait hours, standing alone, but among hundreds of strangers that are too close, and we are all in the dark. Until there is a spotlight, and then silence for a brief moment as there is a collective holding of breath. The anticipation culminates as shadows appear from behind a curtain and turn into figures." In her first solo exhibition, Lisa McCarty captures the emotional landscape of physical, aural and temporal experience. Embodying the transformation from moment to memory, her photo transfer paintings are at once performative and experienced. Through the pulsing colors and figures of original photographs and layers of mixed media, Lisa chases the fleeting moments of sonic energy and heightened experience that she has lived through the Washington DC music scene in the last four years. Exploring the synapse between present and past, the works translate this transformation in a fusion of photography and painting, mediums whose place in the history of art-making reflects this dialectic. The paintings pursue the reconstructive act of remembering such experiences in a layered collage of sonic, visual and textural memories. Hillyer Art Space is proud to present a dual exhibition featuring large-scale paintings by Don Kimes and a selection of Brazilian print art from Sao Paolo, Brazil. After the Flood, by local artist Don Kimes, features collage-like paintings both subtle and abstract. The exhibited work demonstrates Kimes' ability to express the intimate and sensitive effects of time and change in large scales and organic movements. Using obscured contours and vivid color combinations, Kimes reminds us of nature's delicate balance between creation and destruction. Brazilian Contemporary Printmakers, a group exhibition developed by Eduardo Besen, director of Galeria Gravura Brasileira in Sao Paolo, Brazil, features a selection of Brazilian print art. From photoetching to dry point, the selected works exhibit the unique printing styles of emerging and established Brazilian artists. Featured artists include: Paulo R. Carapunarlo, Sheila Goloborotko, Armando Sobral, Andrea Tavares and more. You can be part of the story for the city read of F. Scott Fitzgerald’s The Great Gatsby. The month-long BIG READ – D.C. event kicks off April 24th with a celebration and continues through May 24, 2008. Kim Roberts, editor of Beltway Poetry, has compiled the walking tour of the Dupont/Kalorama neighborhoods, "Jazz Age Stories of the Rich and Scandalous!" The tour will be offered as a brochure (which you can download from the Humanities Council site beginning in April, and take on your own), as well as two guided tours that Kim will lead on Saturday, April 26 and Saturday, May 10, from 10:30 am to noon. These popular guided tour programs are free but reservations are needed (limited number of participants); reservations will be taken beginning in mid-April. The tours are just one of over 40 Big Read – D.C. activities, which will also include book readings, discussions, films, parties, and dance lessons. Labels: "Far and Near Horizons", DC, DC Commission on the Arts and Humanities, Humanities Council of Washington, THE BIG READ –D.C. Maryland Art Place presents Natural Selection, an exhibition produced in partnership with The Center for Emerging Visual Artists™. Participating artists include: Julia Blaukopf, Anne Canfield, Andrea Cote, Jarrett Min Davis, Lillian Bayley Hoover, Darla Jackson, Joelle Jensen, John Karpinski, Rafaelo Kazakov, Mark Khaisman, Jedediah Morfit, Matthew Neff, Caleb Nussear, Tara O’Brien, Serena Perrone, Binod Shrestha, Amy Stevens, Jeffrey Stockbridge, and Brian Zegeer. The most unlikely pairing of visual elements, culled from home décor, fashion, old reference manuals, and action painting forms the visual vocabulary of Baltimore based painter Cara Ober. These works act as an entry point into the artist's unconscious; the connections between disparate images create a visual poetry, full of meanderings and musings, paired with suggestion and associations. Ober's method for constructing meaning is of her generation; she catalogues, documents, and pieces together fragments into internal maps, which document a moving through time. The work of New York architectural firm Diller Scofidio and Renfro encompasses architecture, urban design, and visual and performing arts. Among the firm's best-known projects is the dramatic Blur Building, a media pavilion on Lake Neuchâtel, with a cloud canopy of lake water hovering above it (2002). Recent projects include the Institute of Contemporary Art, Boston (2006); and Facsimile, a permanent media installation at the new Moscone Convention Center in San Francisco (2004). Elizabeth Diller and Ricardo Scofidio, who founded the firm in 1979, were the first architects to receive the MacArthur Foundation "genius award" (1999). Charles Renfro became a partner in 2004. Lecture takes place at the Center for the Study of Modern Art, located in the Carriage House behind the museum. Sen. Pat Leahy (D-VT) is sponsoring the Artist-Museum Partnership Act, which would allow artists to file tax deductions for the market value of works they donate to non-profits. As Leahy tells Robert Siegel, artists are currently able to deduct only the value of the materials used. Write to Your Members of Congress Now! Support this bill by taking action. Sign the Action Letter at American for the Arts. We urge Members of Congress to co-sponsor bipartisan legislation, S. 548 or H.R.1524, which would allow artists to take a fair-market value deduction for works given to and retained by nonprofit institutions. The U.S. tax system accords unequal treatment to creators and collectors who donate tangible works (e.g., paintings or manuscripts) to museums, libraries, educational or other collecting institutions. A collector may take a tax deduction for the fair-market value of the work, but creators may deduct only their "basis" value—essentially the cost of materials such as paint and canvas. In conjunction with the exhibit, "Alter Ego," District Fine Arts in Georgetown will host an art talk on Saturday, March 8, from 2 pm to 4 pm, with award-winning illustrator and graphic designer Elliott Negin and his alter ego, Groover Cleveland. Along with the talk, the gallery will serve tea and other refreshments. The exhibit, which features Negin's drawings and Cleveland's paintings and prints, runs until April 5. Negin's illustrations have appeared the Atlantic Monthly, Boston Globe, New York Times, People, Sports Illustrated, Washington Post and other publications. Cleveland exhibited his neo-Pop paintings in a number of group shows in Washington in the early to mid-1990s and received favorable critical mention, but this is the first time he has shown his work since then. A former Washington City Paper art critic, Negin will discuss a range of topics, including the historical roots of the work, the current status of illustration, and the meaning of life. Preview reception this Thursday, February 28th from 6:00 - 8:30. This is an excellent opportunity to see the art before the crowds on auction night and to get a better understanding of the art selected by the curators...it is always a fun and interesting evening. 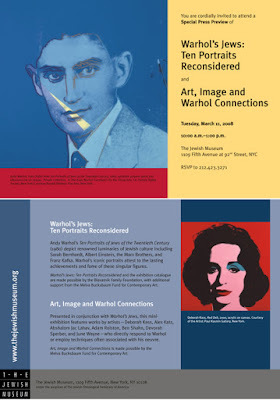 The presentations will take place in the Katzen Auditorium - please be sure to RSVP to info@wpadc.org. Cocktails and appetizers will follow. "Insider's Guide to the 2008 WPA Selected Artworks,"tour with WPA Board Member and noted Washington DC, collector Frederick P. Ognibene, M.D. on Saturday, March 1st at the Katzen Center for the Arts at American University. Fred will lead small group tours through the exhibition of more than 130 works, discussing his experience with collecting works of art, and sharing insights into the auction curator selections. Fred has built an impressive collection of contemporary art, of both regional and international artists, with many works acquired through the WPA auctions and exhibitions of the past. Free tours will be offered at 11am and at 2pm, and will last approximately 90 minutes. Auction ONLINE. For the first time ever, WPA will accept electronic bids on artwork through their website, launching at 10:00 pm on February 28, for those of you who would like to start your bidding early. Preview the artwork featured in this year’s auction, read guidelines and register for online bidding at www.wpadc.org. Rachel Cassiman, the Visual Arts Librarian for the DC Public Library sends over this information. 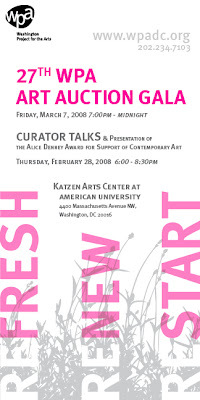 *The Artists' Reception for DC Women in the Arts is Wednesday, March 5, 2008, at 6:30pm. Please contact Larissa Leclair at wpadcauction@gmail.com for more information on the WPA 2008 Art Auction Gala. Did you enjoy the crisp blue cloudy day last week? As much as I am ready for spring, it is a day like this that makes me smile. Clouds, ya gotta love 'em. They say so much. 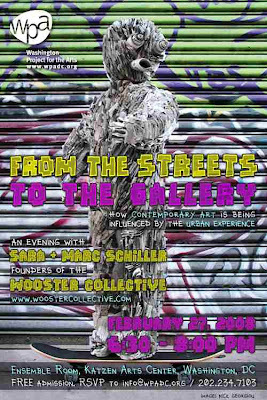 The Washington Project for the Arts (WPA) is pleased to announce “From the Streets to the Gallery: How Contemporary Art is Being Influenced by the Urban Experience” – an evening Marc and Sara Schiller, NY–based curators and founders of the Wooster Collective -- to be held Wednesday, February 27, 2008 from 6:30 pm until 8:00 pm at the Katzen Arts Center at American University, 4400 Massachusetts Avenue, NW, Washington, DC. 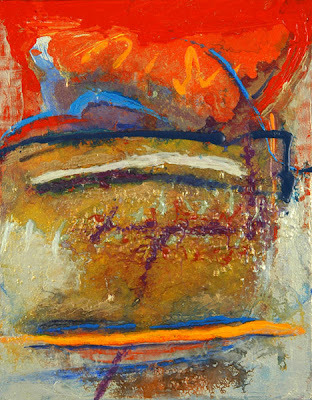 Josephine Haden has been selected as a recipient of the 2008-09 Virginia Museum of Fine Arts Fellowship Award. The fellowship honors professional artists with monetary awards to support their work. The Virginia Museum of Fine Arts has sponsored these fellowships for 68 years. The juror making the selection was Jeffrey Grove, Wieland Family Curator of Modern & Contemporary Art, High Museum of Art, Atlanta, Georgia. HAMILTONIAN ARTISTS announces the ten newly selected So-Hamiltonian Fellows for 2008-2009. Seven jurors made the difficult choices and Pyramid Atlantic donated review space. 128 applicants applied. The ten So-Hamiltonian Fellows for the 2008-2009 season are: Christian Benefiel (Severna Park, MD) Anne Chan (Baltimore, MD) Ian Davis (Baltimore, MD) Leah Frankel (North Wales, PA) Alex Gutierrez (Kensington, MD) Linda Hesh (Alexandria, VA) Al Miner (Washington, DC) Youngmi Organ (Nokesville, VA) Brian Rojsuontikul (Springfield, VA) Michael Sirvet (Washington, DC). Congratulations to all! Tomorrow, Saturday, February 23rd, 4:00 pm, Ben L. Summerford talks about his sixty-year career in Washington. Over at Aesthetic Grounds, an interesting article about public art and job recruitment. The public art field and civic leaders have under-estimated the role of public art in job recruitment, especially among doctors and nurses. Many medical recruiters highlight the excellent quality of a city's pedestrian environment by listing public art....institutions stressing public art are the universities and government campuses where public art has at least a 30-year history. March 7, 7 to 9 p.m. The panel discussion will begin promptly at 7 p.m., only costs $10, and there will be a free reception following from 8 to 9 p.m. - all at Civilian Art Projects. We hope that those of you who are interested in buying art, but don't know where to start, will join DCist and Pink Line for this important conversation. 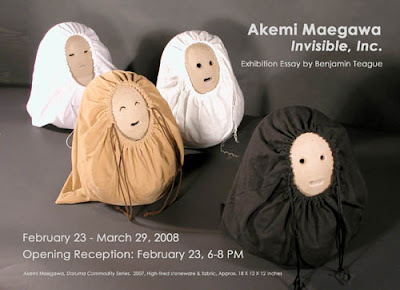 Irvine Contemporary, Akemi Maegawa opens her first solo show, Invisible, Inc. The exhibition features the artist’s sculptures and installation works in a wide range of media and materials, including works in ceramics and fabric. The exhibition investigates the invisible cultural values that surround art objects and the making of art value, opening up the art world's practice as Invisible, Inc. The works engage playfully with ongoing questions about an art work's conceptual basis, the status of the material object, and the effects of scale, size, and materials. The exhibition includes interactive and collaborative works, including a disguised woodblock print press for making artist’s bank notes. Exhibition essay by Benjamin Teague. Flickr Album of Peace Now! Anima Mundi (soul of the world from Latin), a playful dramatization of the eternally fascinating subject matter of nature and being, features the work of three artists share a desire to experience and portray the awe-inspiring. Working in three different mediums – photography, installation, and video – their distinct visions revere, complicate, and question the human relationship to the natural world. Enjoy a rare glimpse into museum collecting practices with The Phillips Collection's director Jay Gates. Gates discusses the importance to the collection of recent gifts and purchases, showing how these strengthen the collection and allow it to develop in new directions. Works by artists such as Edgar Degas, Paul Klee, and Elizabeth Murray are highlighted. Free to members. Included in museum admission for non-members. "Standard Oil" 47" x 28"
40 artists will be exhibiting work in the Peace Now! Show at Warehouse Gallery and Theatre. Here's one of three works that I will be exhibiting. Click this Flickr link to see more work by exhibiting artists. If you are a participating artist and would like to include the work that you are exhibiting (in Peace Now) in an online Flickr Album of Peace Now!, please email me a jpeg for web viewing with your name, title of work, date, size and medium and I will put up an album of the show. email to: blog@annemarchand.com. PEACE NOW! The show will stay up for the observance of the 5th anniversary of the U.S. invasion of Iraq and the March 19, 2008 "March for Peace" in Washington and other cities around the country. The show will feature painting, sculpture, installation, photography, video. Peace Events will be scheduled during the show. Artomatic, in collaboration with the Georgetown BID, presents Glass 3, an International Exhibition, featuring artists from Sunderland, England, Toledo, Ohio, and the District of Columbia. Join us as artists fromt hese glass centers present their work in this unique exhibition of studio glass art. Avner Bar Hama, Doug Beube, Alban Biaussat, Anna Fine Foer, Yoav Galai, Karey Kessler, Joyce Kozloff, Simonetta Moro, Nikolas Schiller, Mel Watkin. THE VIOLIN - One day left to see this film! THE MOST INTERNATIONALLY AWARDED MEXICAN FILM IN HISTORY COMES TO WASHINGTON DC!! "A Movie of Undeniable Gravitas and Monumentality"
Congratulations to local grant recipients for the Franz Bader Grant Awards. Washington, D.C., January 15, 2008— The Franz and Virginia Bader Fund is pleased to announce that it awarded a total of $50,000 to three area visual artists in December 2007. The recipients of these grants are: Heidi Fowler of Reston, Virginia, Michael Platt of Washington, D.C., and Elzbieta Sikorska of Silver Spring, Maryland. Fowler makes contemplative and symbolic landscape paintings that address issues of consumerism and stewardship. Platt, who was born in Washington, D.C., studied at Columbus College of Art and Design in Columbus, Ohio, and received his MFA at Howard University, is known for his prints and drawings. His images are grounded in the human condition, particularly the history of Africa and the African Diaspora. Coincidentally, he is the first recipient of a Bader Fund grant to have shown his work at Franz Bader’s gallery. Sikorska, a Polish-born graphic artist who studied at the Academy of Fine Arts in Warsaw, produces very large landscape drawings over which the figures of wild animals are sometimes superimposed in a way that suggests the great age of the landscapes and the species that live hidden in them. This is the sixth year that the Fund has given grants to artists. Previous recipients of Bader Fund grants include the following painters: Kevin MacDonald and Charles Ritchie, both of Silver Spring, Maryland; Steven Kenney of Washington, Virginia; and Alex Kanevsky, Susan Moore, and Scott Noel, all of Philadelphia. Sculptor Yuriko Yamaguchi, of Vienna, Virginia, received a grant in 2004, and Richard Weaver, of Charlottesville, Virginia, received a grant in 2005 for his terra cotta reliefs. In 2006, awards were made to photographers Frank Hallam Day and Joe Mills, and to painter Philip Geiger. Grant Deadline- Wednesday, February 27, 2008. All applications must be received at the Commission's office by 7:00pm on the deadline date. All applicants must be a resident of the District of Columbia or have a principal place of business in the District of Columbia. The Small Projects Program offers grants up to $1,000 for individuals and arts organization only. The program seeks to make grant funds more accessible for small scale art projects with budgets that do not exceed $3,000. Staff Contact: Ebony C. Blanks Ebony.blanks@dc.gov. DC Commission on the Arts and Humanities, 1371 Harvard Street, NW, Washington, DC 20009. Tools as Art Two: Selections from the Hechinger Collection, and Bill Schmidt's Way, Shape, and Form with an "old-time" Appalachian Blue Grass jamboree. Current exhibiting artist and musician Bill Schmidt, International Arts and Artists Trustee and founding director of the American Folklife Center at the Library of Congress, Dr. Alan Jabbour, and IA Trustee Dr. Rick Hamrick will perform a number of songs on fiddle, guitar, upright bass and mandolin. Come and enjoy the art and down-home wizardry of in-house bluegrass musicians! This event will be casual and is free to the public. Way, Shape, and Form: Small Abstract Paintings by Bill Schmidt features a selection of gouache paintings embellished with colored pencil and water-soluble crayon. The selected works display Schmidt's signature miniature, geometric paintings ranging in size from 4x4" to 7x 5". This closing event will offer a greater chance of actualizing this "parallel experience" because you will have the music which inspired his work! Tools As Art, Two: Selections from the Hechinger Collection, features works from IA's permanent collection donated by hardware store magnate John Hechinger and his family. All the works within Tools as Art, Two depict or incorporate tools as their theme, subject, or media. Because tools are such a basic part of humanity, the Collection's focus on objects and their metamorphosis into art appeals to the builder in all of us. Hillyer Art Space is open to the public Monday through Friday from 10 a.m. to 6 p.m. and at other times by appointment. Admittance is free. Opening Reception: Thursday, February 28, 2008, 7 - 9 p.m. Enjoy a unique exhibition of show-inspired art pieces for a very special cause, the Girls Gotta Run Foundation. This organization supports Ethiopian girls living in Addis Abba and training as athletes while simultaneously completing thie upper-level schooling. All pieces are available for sale and proceeds benefit the Girls Gotta Run Foundation. 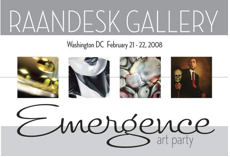 Raandesk Gallery of Art returns to Washington, DC with "Emergence", a two-day art party and temporary exhibition of contemporary artworks on February 21 and 22, 2008. "Emergence" will feature a variety of painting, drawings, photography and art furniture by six emerging artists from the Raandesk collection in a suite at The Flats at Union Row on 14th Street, NW. Both art party evenings are free and open to the public and all artwork on view will be available for purchase. and members of the Capitol Symphony Orchestra, Terry Eberhardt, and Joanne Gabin. Angela White presents her current work in a simple and beautiful new format at www.angelawhite.com. Angela White is one of many artists whose work will be featured at the PeaceNow Exhibition at Warehouse this Friday. Angela White's work will also be featured in an exhibition at the Wohlfarth Gallery later this year. Ms. White maintains a studio in Dupont Circle. She is a colleague of mine and is an artist to watch and collect. Opening Reception: Sunday, March 9, 3 - 6:00 p.m.
Art with Joe Series presents Making Herstory 3: Connected Sisterhood, an art exhibit celebrating the visual, literary and creative art of women. Check the Making Herstory website for updates! Nevin Kelly Gallery to host National Tour of Works by 2007 NSAL Water Media on Paper Competition Winners. Thursday, February 28 from 5:30 to 7:30 pm. Washington DC's Nevin Kelly Gallery will host a traveling exhibition of works by the winners of The National Society of Arts and Letters' 2007 arts competition. The 2007 competition was open to young artists ages 18 to 29 working in water media on paper. Local artist Jenny Davis, a previous exhibitor at the gallery, won this year's $10,000 national first prize for her watercolor "Portrait of Tess." The winning painting and works by the winners of 18 other local chapter competitions who competed for the top prize will be on display. 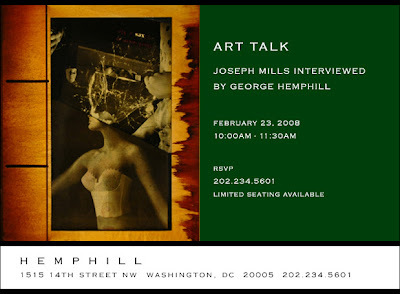 On Monday, February 18, 2008 Lenny Campello will be on the Kojo Nnandi Show discussing the Greater Washington area visual arts and artists and art stories. Check out Daily Campello Art News for information about the show after the show. Urbancode was born in April of 2007 as a pdf-based DC arts magazine. It has since morphed into an interview centered magazine focusing on the best and brightest artists in the DC area and beyond. Urbancode has quickly become one of DC's favorite arts publications and its design has distinguished itself in the design community. Published eight times a year, Urbancode interviews the art personalities that make the DC art scene lively, provocative, and visually stimulating. The Takoma Park Arts & Humanities Commission is seeking proposals for public art projects from artists (of all disciplines and mediums). The Commission encourages applicants to think of the city as a blank canvas and decide what public art projects would best embody the creative spirit and rich history of the community. The deadline for submissions is this coming Friday, February 22, 2008. A total of $10,000 has been budgeted in FY08 for public art. The funds may be spent on a single public art project or work or divided among a number of projects. Projects may be permanent or temporary in nature. The project must be completed by June 30, 2008.
is a HIP CHICK, one of DC's Best Bloggers selected by DC Modern Luxury Magazine. Congrats Hoogrrl! "Color as Field: American Painting, 1950-1975," opens Feb. 29. The exhibition covers the movement in abstract art that focused on thinned paint poured, painted and spread to soak into unprimed canvases to create a simple wash of color. Some of the movement's stars, such as Sam Gilliam and Gene Davis, were based in Washington (and were celebrated with a citywide ColorField.remix festival not too long ago), but this show at Smithsonian American Art Museum will look beyond our local scene, to include Mark Rothko, Barnett Newman and a slew of others. Free. 11:30 a.m.-7 p.m. daily Feb. 29-May 26. Eighth and F streets NW, Washington, DC USA 202-633-1000. More than 20 local artists submitted mini-shows of their work lasting up to five minutes (40 to 50 slides is average), and no one was turned away. Get there early because space will be tight. Admission is free, bring a potluck dish or you're not getting in. The event is BYOB, no red wine is allowed, because it is a gallery space. Blake Gopnik covers "Dreams," in today's WaPO, "the stunning show that opened yesterday at the Hirshhorn Museum, is like nothing you've ever seen in a museum. Its 21 works of moving-picture art -- part of an ambitious Hirshhorn project called "The Cinema Effect: Illusion, Reality, and the Moving Image" -- are strung along a dark labyrinth of rooms. The installation perfectly captures that magic moment of potential when the lights go down in movieland and anything can happen." Thanks to Kate Smith of Sensational Color Pro for this info. 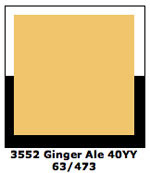 ICI Paints names “Ginger Ale” the color for 2008. Here’s what they had to say about this hue: "Yellow is a color long associated with opposing concepts-oriental and occidental, contemporary and traditional, spiritual and intellectual...People who favor yellow tend to be creative, expansive, inspirational and intellectual; it is very much seen as the balanced colour that sits between the realms of the mind, the spirit and the body. Visionary artist, Alex Grey opened the Chapel of Sacred Mirrors in 2004. "(CoSM) is a sanctuary in New York City for contemplation and a center for events encouraging the creative spirit. The Sacred Mirrors, on display in the Chapel, are a series of paintings that allow us to see ourselves and each other as reflections of the divine." If you are visiting NYC, you might want to pop in and experience the work of this visionary artist. 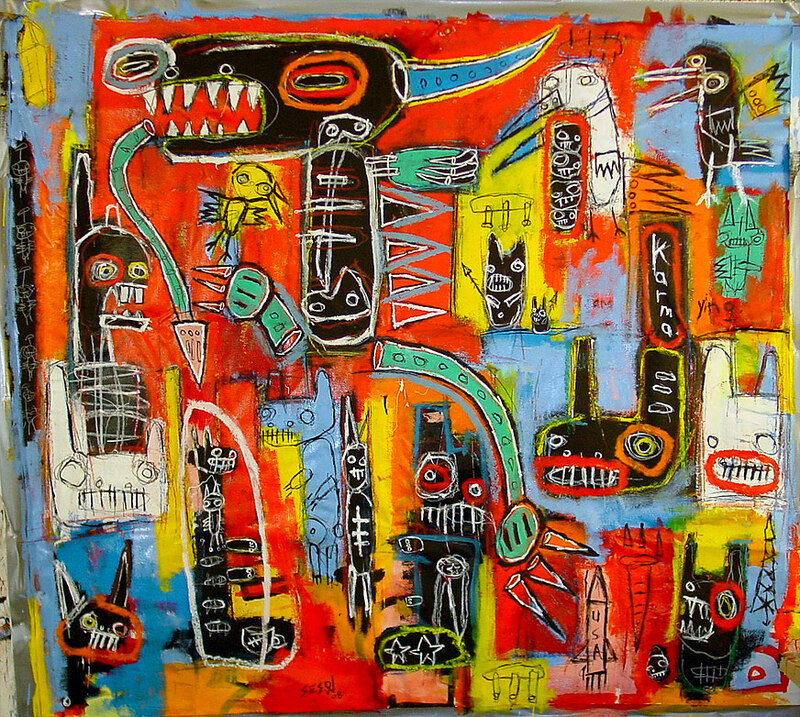 Carey Thompson, Guardian of the Atlantean Sky, 2006, oil on canvas, 30"x48"
Saturday, February 23rd 6:30 pm. Join Alex as he walks through the gallery with visitors and talks about the artwork and the Chapel space. $20 tour fee. (between 10th and 11th Ave). CoSM is open to the public for regular gallery hours, 11 a.m. - 6 p.m.
Commemorating its 30th Anniversary in March 2008, Zenith Gallery will present a mixed-media show featuring trees in all their fabulous forms … be it a Washington tree, a symbolic tree, a grove of trees, a fantasy, an edible tree, a forest or a tree unique to a country, city or state. For Gallery Owner Margery Goldberg, the Trees of Life exhibition serves as a metaphor for the deep roots Zenith has established in Washington, DC, extending out to artists and collectors across America. Artists participating, to date, are Joyce Barker-Schwartz, Gloria Cesal, Julee Dickerson-Thompson, Diane Britton Dunham, Renee duRocher, Leslie Exton, Sofia Gawer-Fische, Robert Freeman, David Glick, Brenda Gordon, Susan Graber, Margery E. Goldberg, Frank Holmes, David Hubbard, jodi, Paul Keyserling, Susan Klebanoff, Jill Mackie, Joey Manlapaz, Michaela Mansuino, Anne Marchand, Michael Madzo, Donna M. McCullough, Carol Newmyer, Ellen Sinel, Bradley Stevens, Steve Tormey, Candice Watkins, Colin Winterbottom, Paul Martin Wolff, Michael Young and Joyce Zipperer; many who have been with Zenith Gallery from the beginning. Some will be creating pieces for this show, and others will present existing works. This week I've been talking to my watercolor students about lost and found edges in compositions, softness or fuzziness as convincing a sense of reality and space. Canadian artist Robert Genn sums it up beautifully in Soft Edges. "While accurate description is paramount for some artists, keep in mind that art also needs to be seductive. Softness is the gentle handmaid of seduction. Knowing when to be gentle is part of the art... Many painters, completely in tune with the value of softness, forget that colour change is also valuable in transitional areas. Gradating up or down the colour wheel--say from red to orange or green to yellow--adds additional zing and deliciousness." "The eye and soul are caressed in the contemplation of form and colour," said the American instructor and author John F. Carlson. "The subtle changes of colour over a surface are transitions like music and are intangible in their reaction upon us. There is an immediate sensual appeal." Just received word that artDC cancelled it's Premier Modern and Contemporary Art Fair in Washington, DC for 2008.
artDC has made the tough decision to cancel its 2008 show due to uncertainty in the current economic climate. Although dozens of galleries had signed on to attend, this decision has been made in the best interests of exhibitors. The DC Commission on the Arts and Humanities (DCCAH) in collaboration with the Executive Office of the Mayor (EOM), and DC Department of Public Works (DPW) seek artists, artist teams and youth organizations to design, create and install aerosol murals or aerosol inspired murals in identified locations throughout the District of Columbia for a new project entitled Murals DC. Murals DC has been created to replace illegal graffiti with artistic works, to revitalize sites within the community and to teach young people the art of aerosol painting. The goal of this initiative is to positively engage the District's youth by teaching proper art techniques, providing supplies, and a legal means to practice and perform their skill in a way that promotes respect for public and private property and community awareness. Site selection is based on areas of the District with high incidence of illegal graffiti as identified by the DPW, Mayor's Office of Community Relations and Services (MOCRS) and other agencies. Each mural will reflect character, culture and history of the neighborhood. Download an application at: http://dcarts.dc.gov. For further questions email Deirdre Ehlen at Deirdre.Ehlen@dc.gov or call 202-724-5613. About creative love from a Painterly Visions interview with author, Eric Maisel..."Love rekindles meaning: falling back in love with art or with your own art replenishes meaning." 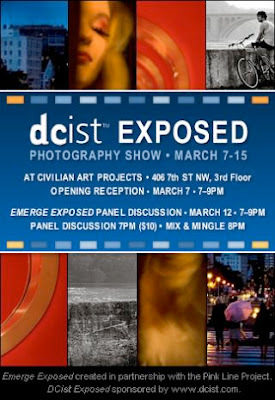 WPA has a new format for it's Weekly E-Newsletter called ARTLIST DC. See it here. "Reflections of the Feminine Divine"
Born from one woman's spiritual transformation, this collaboration between artists is an invitation to reawaken our ancient knowing of the Feminine Divine. From the everyday to the profound, these works are stunning reminders of the divine potential that dwells in all of us. During the show, all are invited to contribute to a collaborative art project "Sophia Says..." sharing words of wisdom we have for our troubled lives and world. Poetry readings contributed from poets near and far will be held at 7pm in the upstairs sanctuary room of New Community Church. More than 700 of the country's leading craft artists will gather under one roof to present their latest hiqh-quality, handmade work to the public - at the American Craft Baltimore Show - the largest juried, indoor craft show in the nation. The highest quality of handmade jewelry, furniture, clothing, home decor, and more, will be available for purchase at the Baltimore Convention Center, One West Pratt St, Baltimore, MD 21201. $14 per person, per day or $20 per person for a two-day pass. Children 12 and under and American Craft Council members admitted FREE. Visit: www.craftcouncil.org/baltimore for more information. Civilian Art Projects partners with the Corcoran College of Art + Design's Printmaking Department to present the 23rd annual portfolio of prints made by faculty and students. You Won't Believe Your Eyes features lithographs, etchings, screen-prints, letterpress, papermaking, relief and digital prints by: Aimee Anthony, Meaghan Busch, Patricia Correa, Dane Austin Criner, Tracey Cullen, Georgia Deal, Bridget Dwyer, Elizabeth Grusin-Howe, Melissa P. Hackmann, Bethany Hansen, Carolyn Hartmann, Hedieh Ilchi, Ema Ishii, Carolee Jakes, Elizabeth Klimek, Eric Klug, Andrew, Kozlowski, Pepa Leon*, Kate Libcke, Kerry McAleer-Keeler, Pierrette Montone, Manuel Navarrete, William A. Newman*, Dennis O'Neil with Alexander Djikia, Dan Payn, Tracy Pilzer, Lynn Sures, Paula Wachsstock, Ann-Cathrine Wasmuth, Randolph Williams, and Amy Zaiss. Participants have been involved in every aspect of producing the exhibition and the portfolio including design, printing and installation. The Washington Post ran an article this weekend about Dorothy Kosinski’s impending arrival from the Dallas Museum of Art. The article highlights changes the new incoming director plans to bring to the Phillips Collection: She hopes to raise $40 million in endowment funds and focus on more cohesive exhibitions. Kosinski is charged with reengaging the Phillips with work by living artists -- much of which, today, is geared toward countering precisely the sleek, modernist aesthetic the museum's founded on. There'll be some juggling to do. Below is a list of Artscape exhibitions that artists can apply for. Applications are at www.artscape.org (click on join us/applications). An exhibition of pen and marker drawings including photographs of the pens used to make them. Interested artists should submit a drawing, text on the pen(s) used and a photograph of the pen(s). This exhibition will travel to Ellipse Arts Center, Arlington, VA and Lump Gallery/Projects, Raleigh, NC and possible other galleries in the coming years. To inaugurate the expansion of the Artscape festival onto Charles Street Midway will present installations, performances, sculpture and other forms of art and performance to create an alternate carnival midway. Artists should submit proposals for 8x8 or 8x16 foot spaces. Honoraria between $200 and $800 will be provided for each project. Mt. Royal Ave. between Cathedral St. and Lafayette Ave. Outdoor Lounge is a public sculpture project where all of the installed works must somehow provide seating for one or more persons. This includes seat designs, sculpture forms designed to be sat on and environments that include seating. Performance/Programing within your seating area will be considered, but not required. Interested artists may submit proposals. Between $500 and $3,000 will be available for each selected project. Curator, Michael Benevento, artist, curator, and co-director of Current Gallery since 2005; an artist run gallery, studio, and performance space in downtown Baltimore. Recent curatorial projects include Under Construction, Automation Constipation, and Hacking Utopia(s) at Current Gallery; Antagonism, Hacks, and Hoaxes at Maryland Art Place; Stuttering at the Carroll Museum; and co-curated The Dilapidated Reanimated Expo at Artscape 2006. The Baltimore Office of Promotion & The Arts (BOPA), Artscape and the City of Baltimore present the second annual Baltimore Sculpture Project, an outdoor sculpture exhibition that will engage sites around the city. This exhibition will open in July 2008, and run through April 2009. This year’s show will concentrate on sites inside the Station North Arts & Entertainment District, at Mt. Royal Avenue and Cathedral Street on the Artscape site, Preston Gardens, and other possible locations yet to be finalized. Honoraria between $500 and $4,000 will be offered. Jurors, Bob Alholm, sculptor; Maren Hassinger, artist and Director, the Rinehart School of Sculpture at the Maryland Institute College of Art; Irene Hoffman, Executive Director, Baltimore’s Contemporary Museum; Sam Holmes, artist and a member of Morgan State University’s Visual Arts Faculty; and Tim Scofield, artist and Sculpture Faculty at the Maryland Institute College of Art. Artscape and the American Visionary Art Museum invite art car artists and all artists to be part of the annual Art Car Show in Baltimore. This year, Artscape will be offering commissions for the creation of new cars, bikes and other wheeled vehicles. Limited travel stipends for out of the area cars will also be considered. Curator, Harrod Blank, art car artist, historian and filmmaker. A Reminder about the PeaceNow! show at Warehouse opening Feb 22. Join Warehouse for this important show. Send label info,etc to christinaruppert@yahoo.com Please send her your info as soon as possible so she can start on the lists and the labels. Include name, title, medium, size, price. Email or bring what you would like included in the book- statement, resume, color copies, show info. When you know what day will work, send Molly a message. Molly Ruppert will be hanging the show the Wed and Thurs before the opening on the 22nd so if you need to come then or if you need other arrangements, contact her. When you bring your work, sign the Warehouse agreement and they will sign your copy. One of my readers brought this very interesting panel discussion about a new book to my attention. Thank you Josephine! A panel discussion on the exhibition and book in which four prominent critics and curators describe the impact of women artists on contemporary art since the advent of the feminist movement. Eleanor Heartney is an independent cultural critic and author residing in New York City. Currently, she is contributing editor for Art in America and Artpress and co-president of AICAUSA, the American Section of the International Art Critics Association. She has written for most major cultural publications including Art News, New Art Examiner, the Washington Post, Sculpture, and the New York Times. Helaine Posner, Adjunct Curator for the American Federation of Arts and is the author of the The Masculine Masquerade: Masculinity and Representation and Kiki Smith. Nancy Princenthal, art critic who has contributed to Art in America magazine since 1985. She is a contributing editor to Art on Paper and the editorial adviser and a regular contributor to Art/Text. She has taught at Bard College, Princeton University, Yale University, Rhode Island School of Design, and Parsons School of Design. Sue Scott is Adjunct Curator of Contemporary American Art at the Orlando Museum of Art. Transformer presents an informal conversation between artists Richard Chartier and Paul Vinet, facilitated by Transformer Board Member, Ryan Hill, Manager of Interpretive Programs and Curatorial Research Associate for the Hirshhorn Museum and Sculpture Garden, Smithsonian Institution.Incorporating distinctly different approaches to covering, and conversely, revealing layers of action/inaction in their work, Richard Chartier and Paul Vinet each intentionally obscure and highlight specific aspects within their paintings, focusing the viewer on details that bring out formal structures while hinting at underlying narrative. During Saturday's artist talk, Richard and Paul will discuss their unique styles and artmaking practices. In addition to answering questions posed by moderator Ryan Hill, the artists will answer audience questions about their work. For further information about Richard Chartier and Paul Vinet, visit Transformer's website. I am delighted to interview Dr. Eric Maisel today, about his recently published book, The Van Gogh Blues- The Creative Person's Path through Depression. In this book, psychologist, creativity coach and successful author, Eric Maisel offers resources for artists who deal with depression. I have read several of Dr. Maisel's books including Fearless Creating and Ten Zen Seconds. I hope you will also enjoy getting to know this insightful author. AM: Eric, can you tell us what The Van Gogh Blues is about? EM: For more than 25 years I’ve been looking at the realities of the creative life and the make-up of the creative person in books like Fearless Creating, Creativity for Life, Coaching the Artist Within, and lots of others. A certain theme or idea began to emerge: that creative people are people who stand in relation to life in a certain way—they see themselves as active meaning-makers rather than as passive folks with no stake in the world and no inner potential to realize. This orientation makes meaning a certain kind of problem for them—if, in their own estimation, they aren’t making sufficient meaning, they get down. I began to see that this “simple” dynamic helped explain why so many creative people—I would say all of us at one time or another time—get the blues. To say this more crisply, it seemed to me that the depression that we see in creative people was best conceptualized as existential depression, rather than as biological, psychological, or social depression. This meant that the treatment had to be existential in nature. You could medicate a depressed artist but you probably weren’t really getting at what was bothering him, namely that the meaning had leaked out of his life and that, as a result, he was just going through the motions, paralyzed by his meaning crisis. AM: Are you saying that whenever a creative person is depressed, (s)he is looking at existential depression? Or might that person be depressed in “some other way”? EM: When you’re depressed, especially if you are severely depressed, if the depression won’t go away, or if it comes back regularly, you owe it to yourself to get a medical work-up, because the cause might be biological and antidepressants might prove valuable. You also owe it to yourself to do some psychological work (hopefully with a sensible, talented, and effective therapist), as there may be psychological issues at play. But you ALSO owe it to yourself to explore whether the depression might be existential in nature and to see if your “treatment plan” should revolve around some key existential actions like reaffirming that your efforts matter and reinvesting meaning in your art and your life. AM: So you’re saying that a person who decides, for whatever reason, that (s)he is going to be a “meaning maker,” is more likely to get depressed by virtue of that very decision. In addition to telling herself that she matters and that her creative work matters, what else should she do to “keep meaning afloat” in her life? What else helps? EM: I think it is a great help just to have a “vocabulary of meaning” and to have language to use so that you know what is going on in your life. If you can’t accurately name a thing, it is very hard to think about that thing. That’s why I present a whole vocabulary of meaning in The Van Gogh Blues and introduce ideas and phrases like “meaning effort,” “meaning drain,” “meaning container,” and many others. When we get a rejection letter, we want to be able to say, “Oh, this is a meaning threat to my life as a novelist” and instantly reinvest meaning in our decision to write novels, because if we don’t think that way and speak that way, it is terribly easy to let that rejection letter precipitate a meaning crisis and get us seriously blue. By reminding ourselves that is our job not only to make meaning but also to maintain meaning when it is threatened, we get in the habit of remembering that we and we alone are in charge of keeping meaning afloat—no one else will do that for us. Having a vocabulary of meaning available to talk about these matters is a crucial part of the process. AM: As well as having a vocabulary of meaning available, how else can an artist sustain meaning? EM: Love rekindles meaning: falling back in love with art or with your own art replenishes meaning. Having other meaning avenues available helps: possessing meaningful relationships and meaningful pursuits other than art-making are good things. Taking action helps: getting to the studio even if the blues have descended and working, even without enthusiasm, can help restore meaning, if not the first day then the second or the fifth or the eleventh. Having success helps: if you can’t find the wherewithal produce, it might be exactly the right moment to redouble your marketing efforts, so that success occurs, which success becomes a meaning boost. And accepting the rhythms of the creative process helps: knowing that the process comes with periods of time when you are lost, or not producing in your voice, or fulfilling commissions that don’t move you, and remembering that tomorrow or next week a sea change in meaning may come. AM: Artists approach making art for all kinds of reasons. Some artists seek truth as a vehicle in the creative process. The search for truth seems similar to the search for meaning. How does the process of discovery, which itself is meaningful, reconcile with a more active stance of making meaning? EM: If there is a paradox there, it is probably a linguistic one. You make meaning by announcing to yourself what you want to value, what principles you want to uphold, and how you want to represent yourself in the world. If what you decide to value and uphold is “the creative process,” then you are honest about what that process entails, including its substantial quotient of “not knowing,” and honorably turn yourself over to that process. You are “making meaning” and at the same time “engaged in process,” a process which you do not force. The force you exert is in the initial decision to make meaning this way and in the subsequent efforts you make to keep meaning afloat, should a given painting turn out poorly, not sell, or otherwise become a meaning drain. You do not exert force in the process itself, which, as you point out, is more a matter of mysterious engagement than of “making something happen” by dint of will. AM: This is the paperback version of The Van Gogh Blues, How was the hardback version received? EM: Very well! The reviewer for the Midwest Book Review called The Van Gogh Blues “a mind-blowingly wonderful book.” The reviewer for Library Journal wrote, "Maisel persuasively argues that creative individuals measure their happiness and success by how much meaning they create in their work.” I’ve received countless emails from artists all over the world thanking me for identifying their “brand” of depression and for providing them with a clear and complete program for dealing with that depression. I hope that the paperback version will reach even more creative folks—and the people who care about them. AM: How does The Van Gogh Blues tie in with other books that you’ve written? EM: I’m interested in everything that makes a creative person creative and I’m also interested in every challenge that we creative people face. I believe that we have special anxiety issues and I spelled those out in Fearless Creating. I believe that we have a special relationship to addiction (and addictive tendencies) and with Dr. Susan Raeburn, an addiction professional, I’ve just finished a book called Creative Recovery, which spells out the first complete recovery program for creative people. That’ll appear from Shambhala late in 2008. I’m fascinated by our special relationship to obsessions and compulsions and am currently working on a book about that. Everything that we are and do interests me—that’s my “meaning agenda”! AM: What might a person interested in these issues do to keep abreast of your work? EM: They might subscribe to my two podcast shows, The Joy of Living Creatively and Your Purpose-Centered Life, both on the Personal Life Media Network. You can find a show list for The Joy of Living Creatively here and one for Your Purpose-Centered Life here. They might also follow this tour, since each host on the tour will be asking his or her own special questions. Here is the complete tour schedule. If they are writers, they might be interested in my new book, A Writer’s Space, which appears this spring and in which I look at many existential issues in the lives of writers. They might also want to subscribe to my free newsletter, in which I preview a lot of the material that ends up in my books (and also keep folks abreast of my workshops and trainings). But of the course the most important thing is that they get their hands on The Van Gogh Blues!—since it is really likely to help them. AM: Thank you Eric for sharing your insights with my readers today.